He has accomplished more rounds of golf than most other presidents in his first 100 days. He has accomplished spending more tax payer money on himself and his family than any other president in his first 100 days. He has created more conflicts of interest in relation to his and his family’s global business interests in his first 100 days than all presidents combined in the entire history of the United States. He has accomplished hiring and firing more persons who were foreign agents than any other president in his first 100 days. He has accomplished more weekend trips to Florida than any other president in his first 100 days. He has accomplished more nepotism in the White House in his first 100 days than any other president in the entire history of the United States. He has accomplished creating the need for more investigations into the possible collusion of a presidential campaign with a foreign government than any other president in his first 100 days. He has accomplished more cringe-worthy and embarrassing moments in his first 100 days than in the entire history of the presidency. He has accomplished getting more white nationalists into high levels of his administration in the first 100 days than any other president. He has accomplished putting into office the most racist and xenophobic United States Attorney General in memory in his first 100 days. He has accomplished creating the most wealthy and arguably least experienced cabinet in the history of the United States in his first 100 days. He has accomplished creating higher ratings for Saturday Night Live than any other president in his first 100 days. He has accomplished making Saturday Night Live Great Again in his first 100 days. He has accomplished inspiring more satire and ridicule from countries around the world than any other president in his first 100 days. He has accomplished openly insulting the press and referring to the press as the enemy more than any other president in his first 100 days. He has accomplished ignoring science more than any other president in his first 100 days. He has accomplished more tweeting in his first 100 days than any other president. He has accomplished insulting and alienating the United States intelligence community more than any other president in his first 100 days. He has accomplished more lying in his first 100 days than perhaps in the entire history of the presidency. That is a whopper of an accomplishment. He has accomplished getting the United States closer to war with North Korea in his first 100 days than any other president since the Korean War. He has accomplished insulting numerous allies and world leaders while refusing to criticize vicious autocrats like Vladimir Putin more than any other president in his first 100 days. He accomplished in his first 100 days congratulating the autocratic leader of Turkey, Recep Tayyip Erdoğan, on being successful at weakening his country’s democracy and tightening his authoritarian grip on power. Perhaps that is the president’s vision of making Turkey Great Again. He has met with far right opposition leaders and far right candidates for office in Europe more than any other president in his first 100 days. He has accomplished writing more bigoted and Islamaphobic executive orders in his first 100 days than any other president. He has accomplished terrifying the most vulnerable among us more than any other president since Andrew Jackson, and he has accomplished praising Andrew Jackson more in his first 100 days than any other president. He has accomplished creating more anxiety and fear among persons who do not want to lose their health insurance in his first 100 days than any other president. 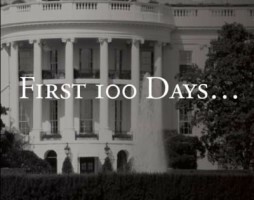 He has accomplished destroying the reputation and standing of the United States in the world in his first 100 days more than any other president. He has accomplished contributing more to exacerbate climate change and create an unlivable climate that will result in horrific human and ecological suffering than any other president in his first 100 days. He has accomplished more to demean the Office of the Presidency in his first 100 days than any other president. He has also accomplished giving rise to a resistance movement to all of his horrible accomplishments more than any other president in his first 100 days, and one can only hope that with this sustained resistance that his last 100 days will come before his first term as president has ended. Perhaps he will become the first president to accomplish being convicted in a trial in the Senate after an impeachment in the House. That would be an accomplishment that would at least give us a chance to Make America Great Again.